What is a Pembroke Table Worth? | Skinner Inc.
One of the guiding principles behind understanding the value of antiques is the notion of “good, better, best”— the idea that seemingly similar pieces can vary in quality, construction, and history. These differences often result in a wide range of prices for the same kind of item. This way of thinking was popularized by Albert Sack in the book Fine Points of Furniture, Early American, popularly known as Good, Better, Best. Understanding the “good, better, best” principle, and knowing as possible about a particular piece will ensure that as a buyer, you don’t pay too much, and as a seller, you estimate your antique accurately so that it sells well at auction. 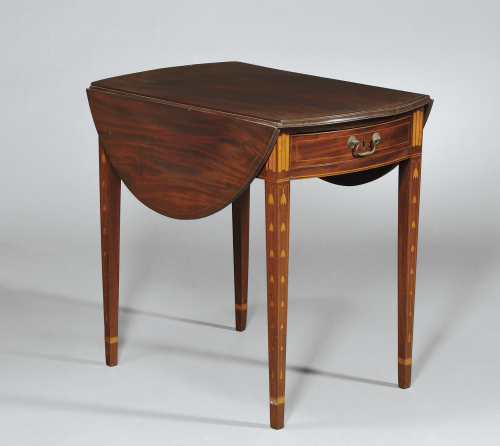 To illustrate this point, let’s look at three Pembroke tables that recently sold in Skinner’s March 2011 American Furniture & Decorative Arts Auction: one from Massachusetts; one from New York State; and an example made in Rhode Island. All three are examples of American Pembroke tables from the early 19th century. 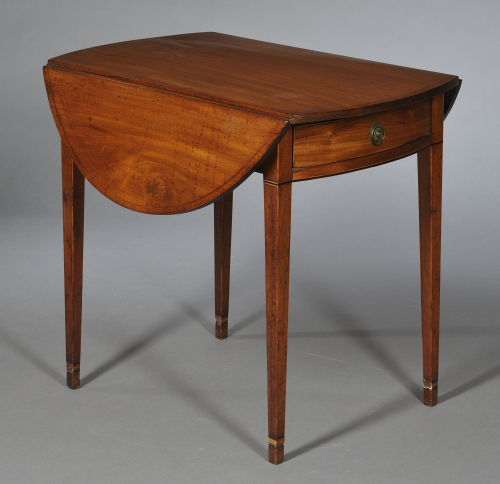 The Pembroke table, named for the Earl and Countess of Pembroke who first commissioned this kind of piece, was a lightweight occasional table used for serving tea, dining, writing, games, and at bedside. Typically made of mahogany, it features an oval or rectangular top with drop leaf sides, one or two drawers, and slim, tapered legs. When not in use, the leaves can be folded down, making it portable and easy to store. 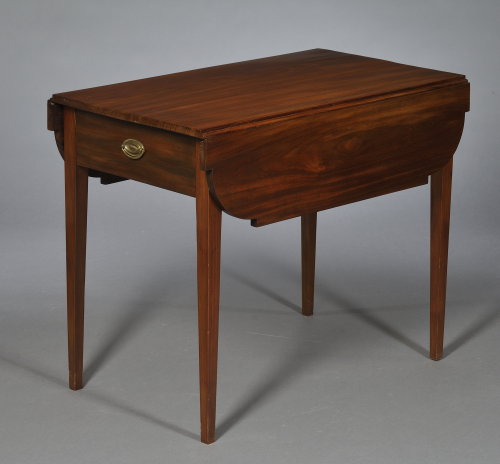 Our “good” example, made in Massachusetts, features a refinished rectangular mahogany top and drop leaves with ovolo corners on a straight skirt and square legs. A finely crafted, basic example, it sold for $650. Our “better” piece is an antique table made in New York State, and it sold for $1,100. The difference in price can be attributed to the more graceful lines and embellishments found in this example: an oval top with demi-lune leaves; string inlay border on the apron and top; and ebonized banding at the bottom of the legs. The wood is also higher quality, mahogany with more pronounced figuring in the grain of the wood. Finally our “best” table, from Rhode Island, is exactly the type of piece that will command a premium price at auction. This example possesses the graceful proportions and refined decoration so typical of the Federalist period. An elongated oval top accentuates the table’s feeling of lightness.The mahogany is richly figured. A striking combination of ebonized and light woods are inlaid into the table’s top. And a delicate garland of bell flowers cascades down each of the legs into the banding near the foot. Finally, the table’s Rhode Island provenance makes it an even rarer find: there simply weren’t that many of them made, and even fewer have survived to this day. This “best” table fetched $3,750 at auction — nearly six times the price of our “good” example. Keep the “good, better, best” rule in mind whether buying, selling, or appraising your antiques. An auction preview is a great venue for comparing pieces side by side. Look closely at the quality of materials, embellishments, craftsmanship, and condition, then stand back and assess the overall beauty of a piece. Still unsure? Consult the auction specialists – their expertise can guide you in understanding what’s good, what’s better, and what’s best. This entry was posted in Blog and tagged Americana, antique table, Collecting Tips, Consignment FAQ, Karen Keane, pembroke table, value of antiques, what is my antique worth by Karen Keane. Bookmark the permalink. Small correction – these are not from early 18th century – believe you meant 19th. Though the RI example is late 18th by your estimate. Good spotting. Of course you are right, and we have fixed the error. The image captions are indeed the correct dates. Thank you. I am looking for some guidance and thought I would start here after reading your post. I have a pembroke table and would like to have it appraised. Is there an online appraisal organization or somewhere I can bring the table to. I am on Long Island. I have a table like the “best” one that belonged to my grandmother. I stupidly removed the varnish off the top (the drop leaves are untouched, as well as the rest of it.) I would love to find a buyer but would hope for at least $5,000. Would that be a possibility? We’d be happy to take a look at photos of your table to estimate a value. You can submit photos online using our free online auction evaluation form: https://www.skinnerinc.com/appraisals/form.asp Thank you! I have an English Pembroke table, which I am guessing is in a satin wood finish and i guess it is from the mid 18th century. Would you have any idea what the value of such a piece would be. Please send images and a description of your table using our free online auction evaluation form: https://www.skinnerinc.com/appraisals/form.asp – Our appraisers will take a look and give a free auction estimate. My father has a pair very similar to the “better” example. They are in very good condition with the exact same pulls on the drawers as your photo as well. He was wondering if the value would be any higher because they are a matched pair? Are there any particular markings or identifying features he should look for to determine age or authenticity? Thanks for your comment. It’s always nice to have a pair! Usually, having two of the same thing will increase the individual value of each, whether they be chairs, vases, candlesticks, or Pembroke tables. I have a Pembrooke table that my father told me was circa 1760 before he passed on. It is in need of some minor repair (has water marks on the top) but is otherwise sound. I am more interested in getting it restored than selling it. Would restoring it reduce it’s value? I would appreciate any help or advice you can share. While it is always advisable to keep restoration to a minimum, there are times when you must fix or repair an object. Water marks on the top surface of a Pembroke table are probably unsightly. Early 19th century cabinet makers chose beautifully grained wood for table tops and that figure is compromised when the wood is stained. I would suggest looking into the refinishing of the top providing you can find a restorer with a light touch. You might want to inquire at a museum in your area that has a collection of decorative arts including furniture. Museums often hire restorers for their collections. These restorers will come with the recommendation of the museum. That should mean you are in good hands. I recently purchased a pembroke table with inlaid designs similar to the best example above at an auction. Overall it is in great condition with a few minor (untouched) chips near the front table top. Do you have any idea how I can find out its value? Thank you for your comment. You may submit pictures and a description of your table for a free estimate of its value using our online auction evaluation form: https://www.skinnerinc.com/appraisals/form.asp. I have a Pembroke mahogany 225 drop leaf dining table with square tapered legs. It has 2 drawers with brass hardware. It is is very good condition with only a few nicks and scratches and has had some minor repairs. Sorry, I can send some pictures, I am just wondering what this table could be worth. I have not seen any other tables like this one, with the drawers and it even has a label stating specifically where the mahogany wood came from inside one of the drawers. Thank you!